I am sending this recipe to Rice Mela. Looks and tastes so good.It has that aroma of authentic Hyderabadi.It cannot be put in words,it has to be experienced. This reciepe reminded me of the experience I had when I tasted the biryani prepared by Late Shri Alam Saab, chief cook of the Hyderabad royalty at the Chowmahalla palace. Thank you. Yum! I’m definitely putting this on my to-try list. hey i hv a doubt here!u said rice n chicken shud b mixed n left for dum…shudnt v cook hicken first seperately and then mix it wid half cooked rice n leave it for dum?? ?plz lemme know? the one you are referring to is pre-cooked or pakhi chicken biryani. I prepare mutton biryani that method. If you wish, you can follow that method for chicken biryani too. In which case, you have to cook rice little long, until it is almost done. awesome!! we tried and loved it!! thanks for sharing…..
Sunitha, you can use about 3 1/2 liters or quarts of water. I use a 4 quart sauce pan and fill it up to 3/4 – 7/8 level to cook the rice. You asking the water quantity to cook the rice, aren’t you? Thanks for sharing this recipe. We loved it and I am going to make it again tomorrow along with the chicken shorva. vow! recipe sounds delicious. iam ready to prepare.thanks for sharing. hai…i am going to try this recipe for lunch on my FIL’s b’day ,he loves chicken biryani…will let u know how it tasted …. I have tried this method and The Biryani was superb. It tasted soo good and looked excellent. It reminded me of the Bawarchi Biryani in Hyd. Thanx for the wonderful receipe. Asha, I am glad you liked and thanks for leaving a comment and letting me know how it came out. Comments like yours are very encouraging . Thank you! I tried this recipie. It turned out excellent. Thanks for sharing that. I am glad you liked it and it turned out well. Thanks for letting me know. It is very encouraging when i receive feed back from my readers. My wife tried it yesterday and it turned out fabulous despite making do with less Ghee than suggested. The ‘zaffran’ was the weakest link probably because the one we used tasted a little medicinal, but other than that it was F-A-B-U-L-O-U-S! Cassy, thank you for let me know how it turned out. I use kewda once in a while and I add it to cooked rice and chicken along with saffron milk. Next time I will try adding it to boiling water. I don’t have any recipes using plums. I know lot of recipes call for nuts and dry fruits in biryani but I personally don’t like them in biryani. If I come across any good recipes, I will let you know. Hi , if i want to cook in oven at wat temperature should i cook and how long? I’ve been looking for an authentic recipe and based on the recipe and user comments, maybe I have found one! Will try for my family asap! Thank you for a wonderful recipe , it came out fantastic .Now have to try the mutton. The recipe sounds excellent to me-will try it very soon-but I was wondering what is the function of ” 1 cup of chopped mint”? There is no specific function of mint. It just adds more flavor to rice. If you wish you could cut back a little on mint but do use at least some of it. sorry,mujhe acha nahi laga aapka preparation ..that untaste full. I am sorry it did not turn out good. This recipe sounds very delicious and I really want to make it for my husband since he is always begging me to make biryani. I feel confident now that I have found a very authentic recipe. I just have one question, are you placing uncooked marinated chicken when you start layering it with rice or it’s half cooked? If it’s only marinated, can the chicken cook all the way in 15-20 mins?? Ok, so I had two questions, but please help. I used raw marinated chicken. The bottom layer is chicken followed by 2 layers are rice. In the US chicken cooks very fast. It will be done in the time I mentioned. This recipe looks delicious! I have a couple questions before i cook this. What type of chicken do you use? Is it a whole chicken or just like the chicken breast? Do you use bones or boneless? Also wanted to know if you have a good recipe for tamarind chutney? Thanks a lot! I use whole chicken and I cut it into desired pieces. This way I get all teh pices, bonless and bone chicken. I am sorry, I don’t have any recipe for tamarind chutney. hi. i tried your your chicken biryani and it turned out awesome. i am from andhra but born and briught uo in mumbai. recently we were in hyderebad for my husband’s official work and we visited the paradise restaurant. the biryani was superb. i am always in look out for goog recipes and am very fond of nonveg. the biryani masala you mentioned in the recipe is very authentic and no need to out any store biught masala. i love your recipes. i want you to put up spicy chicken curry andhra style. i live in bombay but all my neighbours keep asking me the recipes i make though all of them are maharashtrian they love andhra food. i am very much inspired by you. I had to let you know …. your recipe is awseome!!! I am based in Markham, Canada and could find all the ingredients with ease. First time i tried Briyani & it was beautiful. Tried your recipe today with a small twist …amazing !! Excellent style.of preparing Hyderabadi Dum chicken Biryani. I have been fallowing this style from past 10 time and never failed. 1) in the pre cooked method , i just need to cook the chicken in gravy for some time nd the rice needs to be 75 percent cooked right ? 2) i dnt ve a huge cooking pot, so hw long do u think i can put it in the oven ? at wht temp ? Sorry for the late reply. I have not been blogging lately and did not check the blog in the last few days. Yes, cook the chicken until is fully cooked and all the water evaporates. Rice needs to be almost fully cooked, that is about 80-90% cooked. Then arrange chicken pieces and rice in an oven safe pan or a dish, I would prefer a long dish or aluminium pan and bake for 10 minutes on 400F and 20-25 minutes on 350F. Bear in mind oven temperatures vary from oven to oven. You can follow my Mutton Biryani recipe and if using chicken, it can be cooked on stove top and does not require pressure cooking. I cooked it last week, Everything was great, like , smell, taste, but it got burnt in the bottom. I am in Minneapolis, MN. I rarely cook and never cooked Biryani before. Used to spend money every weekend to buy Hyderabadi Biryani from an Indian store. Tried your recipe. Took about 3 hrs but the end product was awesome. My family loved it as well. Thank you. Now I am very confident that I will never buy it from outside again. Hi, The biryani turned out amazing. All of us enjoyed thoroughly:). But mine got burnt a little at the bottom. Why did that happen? Rest everything was great. Sana, cook it longer on low flame and shorter on high flame… that might do the trick…. or add a little bit of water or milk to keep it moist. I would strongly suggest cooking it longer on low flame though. Can you please tell me how many whistles you keep when you pressure cook the rice. Thank you. Actually I was looking at the recipe for Egg Biryani..and my previous question was related to that. Hi, for all the ingredients requiring a measuring cup, like water and yogurt, do we use the rice measuring cup or a regular measuring cup? For rice, oil & water I used rice measuring cup. For rest of the ingredients I used regular measuring cup. For milk, I do not remember what I used. I think I used the regular measuring cup. Thank you for this recipe! It comes closest to what I’ve had in Bangalore, and folks I’ve made it for thoroughly enjoyed it. hi… i dont quite understand what you did with the lime juice and salt to taste thats under the spices for ground masala? Lime juice and salt are part of the marinade. I will list it before the garam masala to avoid the confusion. Also, what is Bay Flower or Biryani Flower? i live in the UK. I have many asian cash and carrys nearby but i dont seem to remember ever coming across this? what does it look like? If you can not find biryani flower, you can omit it. I don’t know if you get it in the UK. I live in the US and we don’t get it here either. I bring it from India. I don’t know the other name for Biryan flower, however I will give to a link to the images. thank you for replying… i have one more question please… which cardamoms do you mean? black or green? thank you. i really want to try this recipe as i’ve never cooked chicken in biryani just by dam. Green cardamoms, the one we use to prepare garam masala or in cooking… not the big ones. i finally cooked it! wow! it was soooo good. even though i lessoned the chillies it was still HOTT but sooo tasty! absolutely loved it! unfortunately i couldnt find the biryani flower but i was still so tasty. I was so skeptical of the amount of mint you used but how wrong i was!! LOVE IT LOVE IT LOVE IT! if i could trouble you with another question please. what kind of dish would you recommend to cook this kind of food in? i cook for a LARGE family. and cooper pots are so expensive. i dont like non-sticks as im paranoid about them chemicals. and how thick should the base be? sorry i know you’re probably sick of me. But thanks for this great recipe. i usually use boxed mixes but never again! Hi, thanks for replying and don’t worry about it taking quite long. I know you must be busy. I’ll wait for the links for whenever you get a chance. I do use the tawwa technique you gave but I need a bigger pot & wanted to know what to go for. I also wanted to let you know that i was asking around online about Biryani Flower. Someone told me that in English it’s called Star Anise. Have you heard of it? I couldnt believe it as i have that in my cupboard! It’s very strong. She also said that Anasapauvvu is the telugu name for it. Thanks once again, your a gem! I am sorry for the late reply. The Biryani Flower I use is not star anise. You could substitute it for the Biryani Flower or you could skip it all together. As for the pot, today I was in Macy’s, a department store in the US, and checked out the cookware. I don;t know if you get these brands in the UK. I will give you the links so that you get an idea how thick the bottom of the pan ought to be. also check the belgique pot. I cooked in this pot at my cousin’s place and it came out good. No matter which brand you buy, make sure the bottom is thick. Both Cuisinart and Belgique have a thick bottom. OR why don;t you check out the pots in Indian grocery stores? They might have pots that are used in India. I am from Andhra too, started cooking only after I came to USA. I accidentally came upon your blog and loved the biriyani recipes. I made both Hyderabadi Chicken and Mutton biriyani in pre-cooked meat method. Both times the biriyani came out just great, even though I used less oil and didn’t use saffron. Thanks for posting the recipes. Thanks for letting me know! It is encouraging when I get some feedback. Just one word! Delissshhh! Perfect taste and texture of rice! My only issue was that my chicken got burnt. I salvaged as much of it as I could. I used a dutch oven on my electric stove. How do you avoid burning it? I’d like to try cooking it in the oven without pre-cooking the meat…any suggestions for temp and how long? Thanks again! There are 2 thing you could do to avoid burning of the chicken. 1. Add more water so that the chicken doesn’t burn. 2. Reduce the cooking time on high. If you cooked it for 8-10 minutes on high, I would suggest 6-8 minutes perhaps… Cook it just until stream starts to escape from the vessel and reduce the heat. Also reduce the cooking time on medium heat. Cook it for only 17-18 minutes. It is a little tricky with the electric burns… although we reduce the heat, the burn is still hot and takes a few minutes to cool down the burn/coil. I would suggest you open the pot, mix it well and if the rice is not done, then cook it for few more minutes. I have not cooked tried raw meat biryani in the oven. I would suggest cooking it on 450 F for about 15 minutes and then reducing the temperature to 350 F and cook for another 25-30 minutes. Check if it is done and if not, bake it little longer. As I said before, I have not cooked raw meat biryani in the oven. If you do try it, let me know at what tempaerature and how long you baked it. I used your recipe and it came out awesome. But I was so foolish that I didnt read the comments before I tried the recipe, if not wudnt have burnt the dish, though it didnt give the burning smell and secondly the rice was kindda over cooked but didnt have the texture of how it sud be for briyani’s and the colour was full of masala and was unlike urs.. other than that it was awesome, spicy and wonderful. First time to your blog and you have wonder ful recipes indeed.. Thanks. You can use any kind of milk. I used 2% milk but I also use 1% milk. You can use whole milk, if you wish to. Maybe I am the first “gora” to have cooked your recipe? I lived in Hyderabad for some time and fell in love with the Biryani so bad! So I cooked this at home for my girlfriend and a friend (both German), following mostly your recipe (though I peeked at a few other recipes, and had to skip some ingredients which were impossible to get). It turned out really great! Thank you for posting this easy-to-follow and really tasty recipe. Nowadays, whenever I visit Hyd, I end up eating lot of homemade biryani and have not tried it out at restaurants. From what I remember, Paradise & Hyderabad House have good biryani. I once ate biryani from four seasons and that was delicious… I hope this helps. This is absolutely marvelous and wonderfully written recipe. up till now i have like cooked almost 10 times , and each time my frnds and family are gushing, appreciating loving it . The only issue i face it that i use pressure cooker and bottom most cihcken part sticks to the surface . i guess i leave it on high flame a little longer. Tomorrow i have to like treat 10 of my frnds , so i am going to use twice the amount written and just hoping it turns out the same. Thanks once again for sharing this . Thanks Shanj, for you feedback! I guess you are cooking it on high flame for too long. Good luck and happy cooking and hosting your friends! I tried this 2 days back.. This by far was my best Biryani receipe. This now replaces my other receipes. Thanks a ton for sharing this receipe. Refering to Shanj, I had also suspected that chicken will stick to the bottom causing it to blacken. To avoid that, I put potato slices covering the bottom of vessel. It helps. Thanks for sharing this delicious receipe !! That is a nice idea pradeep.. but if you don’t want vegetables in your biryani, you could try using a tava or a thick bottom frying pan. Place the pan on the stove and your biryani pot on the pan. This might help.. This is an excellent recipe. I have been referring to this recipe since last year whenever we cook Biryani. The tip to cook rice only for 2-3 minutes is wonderful. I always used to wonder how restaurants have each rice grain separated. And now i know!! hi, i stumbled upon ur blog searching for a biryani recipe and tried this out. must say , my work was over in less than an hour and what a delicious biryani. we have our own style of biryani but loved your style too. thanks. I am glad you liked it! Thanks for letting me know. half boiled rice in oven what temperature should I put. Cooking kachi goat biryani is little tricky. I have had mixed results. I feel the meat we get in the west releases lot of juices. Sometimes the biryani use to come out perfect but most of the time, it was a disaster… either overcooked rice or undercooked rice. So, now I prefer pakhi (precooked) goat. You can check Mona’s blog.. She has instructions for oven cooked kachi biryani. http://zaiqa.net/?p=3611 I hope that helps. I used the measuring cup that comes with the rice cooker, which is 160ml. Looks like I forgot to mention it in this post. I always use my rice cooker measuring cup to measure rice. I will update the post right away. Thanks for bring it to my attention! Tx for the info, as i tried with glass & the biryani became kind of pasty. Sticky rice could be due to any reason. Also use the same cup/glass to measure rice and milk. Thanks for the recipe…tried it and turned out really good!!! My biryani turned out good too. For the marinade I made a slight variation. I used ready made MDH garam masala powder (3-4 tsp) in the marinade and lot of Pudina. A perfect recipe, though it came out better in second attempt. Thanx for sharing this marvellous recipe. To cook the rice for 80-90%, I use 1: 1 1/3 cup rice to water. In this recipe, the rice was less than half cooked. I used 1 rice : 3-4 cups water. Hope this helps. thanks dear. it came out yummy as said by my husband cause I am a vegetarian. He loved it so so so much that I had to make it twice within a week. thanks again. you totally rock. as I said earlier, these are small mercies from up above. May God bless. Wonderful receipe, I am a vegeterian and I cooked this for my husband who just loved it:) Thanks for the detailed Receipe. I am newly wedded and i very new to cooking I loved your recipe and I have tried your recipe today.. and to my bad luck it got burnt and it didnt turned good . 🙁 and the rice was over cooked i mean it was very soft.. actually i can cook rice only in the rice cooker.. that might be the reason of my very soft rice.. pls help me to get it properly,.. i want to surprise my hubby..
Latha, first of all, looks like you over boiled/cooked the rice. Second, if the chicken got burnt, that means you cooked it on high temperature/heat for too long. Next time you make it, don’t boiling the rice for too long. Cook the biryani for 6-8 minutes (in the recipe I said 8-10 minutes) on high and then reduce the heat and cook it for another 20 minutes. Wait for 10-15 minutes and then open the pot. If the chicken and rice are uncooked, cover it and cook it on low for another 5 – 10 minutes. If the chicken is cooked and not the rice, don;t panic… cover and let it leave it for another 10 minutes. The rice will be perfectly done to the heat. Hope this helps. Also emailed you with a few other options. If you have more questions, do drop a comment or email me. thanks a ton… today i prepared chicken biryani and it came out superb.. the only issue was it was a bit spicy.. but really was very very tasty.. thanks alot.. I guess you used Electric Stove (I have electric stove here in my apartment). When you say high flame should I use HIghest setting like 10 ? Also what setting would be medium low 5 ? Samiksha, I have a gas stove. I have not cooked on an electric burner in almost 10 years. You have to do so some trial & error to figure out the right setting. I would suggest you use 9 (recommend) or 10 setting for high and either 3 or 4 for medium low. The recipe calls for cooking the biryani for 8-10 minutes on high. Make sure the steam is releasing from the foil before reducing the heat. I know the electric burner takes a while to heat up but gets very hot once it has warmed up. Also, the same when you reduce the heat. It takes a while to reduce the heat after you change the settings. If you smell the food burning, turn it of after 18 minutes are so. Do keep in mind that when the biryani is cooking, your kitchen and the apartment will be filled with biryani aroma. Atlast i have prepared this receipe, it came excellent. The only thing is it was bit over burnt down. This could be problem with pan. I used pressure cooker. Taste was very very good. Thank you so much for your recipe. we had the real taste of hyderabadi biryani. Thank you so much for your efforts!!!!!! Radhika, thanks for trying out the recipe and for giving me your feedback. Figuring out the cooking time is basically a trial and error method. Should try reducing the initial cooking time to 6-8 minutes, instead of 8-10 minutes. OR you can cook it on medium high instead of cooking it on high. I hope this helps and thanks again for giving me your feedback! You can add at least 10 tbsp. I never measured but I am guessing it would be around 10 tbsp. I will measure it the next time I make it and update the blog. I am on vacation right now and give the exact measure. You would be straining the water so the rice won’t get salt. Followed all the steps. Let’s see how it comes out tonight!!! I tried this recipe, dint have pan, so used cooker! And chicken totally got burnt in the bottom 🙁 🙁 trying it again in a fabreware sauce pot! Hope it comes out good now ( I got Electric gas) sigh! So difficult to cook good food on electric gas!!! Hope this time it comes out better, by the way, no tomato in biryani? Since you have a electric burner, it is difficult to say how long to cook. I would suggest you cook on medium high until steam escapes from the foil seal and then reduce the flame to low. Use the cooking time as a baseline until you figure out the exact cooking times for your burner. Good luck and hope it turns out better this time. Okay..I hve been making my version of biriyani(oven baked with no oil at all!) all this while until today when my husband asked me to cook something ‘different’! Googled ‘chicken biriyani’ and got hold of your recipe. I found it the easiest to follow(I am not much of a cook!). Was a little surprised to find out that there was no tomato in your recipe but followed your exact procedure and the biriyani came out to be so superbly awesome!! Me and my husband just loved it! It looked so professional so restaurant like! I just wish I had anticipated our appetite and made a little larger portion!! What type of dried plums are used? where can i find them here in the U.S? are they the same ones that we get in a regular grocery store. Hi, I tried this recipie several times and it always tasted very good. Meant to write each time i make it. Flavour, texture everything comes out nice each time. My only concern is chicken, it tastes good but it always looks dry and not moist as it looks at restaurents. Is there anything i can do to keep chicken moist and not dry? I will be thnakful if you can help me out in this… otherwise this is an awesome recipie and actually tastes better than many indian restaurents in my area. Vasantha, I usually do not refrigerate the marinated chicken. I marinate it 1-2 hours before making the biryani and leave it on the counter top. If I do marinate it overnight in the fridge or if I put the marinated chicken in the fridge, I bring it to room temperature before cooking it. Cooking the chicken at room temperature always worked for me and it doesn’t become dry and is moist. I hope this trick works for you too. Lovely recipe! Tried it today and worked wonders! Now, would be willing to pamper my family with more recipes from your website. Keep up the good work of cooking with love! I am based in Delhi. I usually make mutton biryani the raw meat method, and it takes about 2 1/2 hours to cook. I think that Indian broilers take longer to cook than US ones, so how much time should I cook for? Ajoy, I would suggest 10-15 minutes on high until the steam begins to escape from the seal and then for another 30-40 minutes on low. I think the cooking time also caries on how tender the broiler is. Back home, my family always buys a broiler which is 1 – 1.5 kgs and when cooking in large quantities, they buy multiple broilers weighing around 1-1.5 kgs. Happy cooking! – 40-60 min total cooking time in a 12″ diameter pot. Yes, for 1 kg chicken you can use 1/2 kg (500gms) – 600 gms rice. Some people use up to 1 kg but I prefer 600gms.. The pot I use is about 10″ – 10 1/4″ in diameter. 12″ should be fine too. The idea is to spread the chicken in one layer. I think 1 kg chicken should cook in 45 minutes and max 55 minutes. Ken, I cup (measuring cup that comes with the rice cooker) rice is approximately 150-155gms. For 4 cups you will need 600- 620 grams of rice. I always cooked the raw meat method on the stove top or in the rice cooker. I like to cook biryani in a wide pot where I can spread the chicken pieces in in one layer. If you do not have a wide pot, I would still suggest putting all the chicken in the bottom most layer and 2-4 layers of rice. You are welcome, Ken. Raw meat method is this chicken biryani recipe where I layered raw chicken with partly cooked rice. best biryani ever. and the rice finally came out right. thank you so much for posting this recipe. i am now a follower. add another gora to your mix. As per the step 8, how much oil i need to pour? Half of the size of pan.? I will trying this recipe on the coming weekend so wanted to be sure.? This proportion works well as I have tried from 1kg to 5kg. Snehith, I am sorry for the late reply. I was busy the last few days and did not check the blog. I am sorry this recipe did not work out for you 🙁 The recipe above is raw meat method; where raw chicken and partially cooked rice is layered and cooked together. I cooked biryani on the stove top and I have not tried it in the oven. If you want to cook the chicken first and then prepare the biryani, follow my mutton biryani method. In that preparation, marinated chicken is fully cooked and until tender & water/juices evaporates. Rice is almost fully cooked, that is about 80-90% cooked. Then chicken pieces and rice are arranged in layers in an oven safe pan or a dish, I would prefer a long dish or aluminium pan and bake for 10 minutes on 400F and 20-25 minutes on 350F. Do remember oven temperatures vary from oven to oven. Here is the mutton biryani recipe. Chicken can be can be cooked on stove top and does not require pressure cooking. If you want to cook in oven, then you need more time. I prefer the stove top method, but oven will do fine. For roast chicken I cook for about 1.5 to 2 hours, so I guess that for biryani you will need at least 1.5 hours in the oven. Note that the longer the cooking time the lower the heat used, else you will get burnt outer layers and undercooked inner layers. Chicken is uncooked when layered. And yes, it will cook properly. At least in the US, chicken cooks pretty fast. I have cooked biryani for max. 20 people with this recipe, although I used uncooked rice soaked in water for about 30 minutes, instead of half-boiling it. To be honest, I never cooked biryani for a gathering of 50 myself. I can give you a few pointers though.. The marination time still stays the same. Cooking time may vary depending on the stove you are using. If you are using a cooking range/stove with a bigger burner, then the cooking time still remains the same. If you are using the same burner you used for cooking for 20 people, you may want to increase the cooking time. Cook it on high until the steam escapes from the sides of the cover. I am guessing you may have to cook it for 12 – 15 minutes on high and then reduce the heat and cook for about 30 minutes. Happy cooking and good luck with the preparation. For 50 persons you will need 2.5 times more meat and a bigger & wider cooking pot, so that there are at the most two layers of chicken pieces. My preference is one layer, but for that you need a pot of at least 30 inches in diameter. In my case I use 3kg chicken for 12 persons, which may be stretched to 20, so in my estimate you need at least 7.5kg meat, hence a wider vessel. As chicken cooks quite fast, you will need at the most 30-40 minutes after the steam escapes, and that too at a minimal heat. The maximum I have cooked at a time is 5kg Mutton Biryani and that is about the limit for a 24 inch pot. Ajoy Roy, thanks for a the detailed tips & the measurements. That is very useful. I went thru the link and it is a detailed explanation. Thanks again for replying Aniket’s comment. Have tried this today and it was awesome, everybody in my fly liked it! Thanks. Hi, for the water and yogurt, do we still use the rice measuring cup? Asma, for yogurt use regular measuring cup & for water use the rice measuring cup. I was wondering is it okay to cut the chicken into only two 4 pieces and use this recipe instead of small pieces? My dad likes the biryani with big pieces so asking! Cutting the chicken into 8 pieces might be a better than 4 pieces. Chicken cut into 4 pieces might be too big. Yes, you can cut chicken to desired size, even 4 pieces is also fine. You can have big pieces as long as the pieces cover the bottom of the pan fully. You have to ensure that there are no gaps left. I usually have all the gaps covered by pieces. So in effect you will need two or more chicken if you cut each into 4 pieces. By the way you can use the neck and wings also. The add to the taste. If you leave space at the bottom of the pan, rice will fall into the space and will most probably burn. It is the meat that forms a buffer between the pan bottom and the meat and keeps it moist. Thanks Ajoy for your suggestions & tips on this. Thanks a lot it was really helpful..Do about adding kabab powder as well. the taste will be good. Will try it next time. Thanks for letting me know. Your recipe is very good. However, I want to know the brands of rice, oil, curd and etc if possible, They really make a big difference, especially rice. Your rice grains are longer which means they are not the normal brand but a better grade. I usually don’t use recipes to cook biryani but use my own and it turned out well. However, ur recipe impressed me and wanna try for the 2nd time (first I tried Paradise Biryani recipe and failed terribly because they did not mention many things right) and hopefully it should turn out well. Karthik, sorry for the late reply. I used Pari brand basmathi rice when I prepared the biryani for the blog. I used that brand of rice for a long time but lately, I am using Swad dehradun basmati rice. I use berio filippo olive oil but you can use any brand of vegetable or canola oil. If you want it a little rich, 1/2 oil & 1/2 ghee or 3/4 oil & 1/4 ghee. As for curd, I usually use stoneyfield farms non fat yogurt or non fat desi yogurt from the Indian store. I usually use non fat yogurt but you can use low fat or whole milk yogurt. I hope I clarified your doubts and happy cooking! For best results I use Ghee, prepared at home. Buy white butter (the unsalted type), Boil it till the residues come out and the butter clarifies. When the ghee is ready it will start foaming, and that is when you switch the heat off. Let it cool and then filter it. Vegetable oil (including olive oil) does not give you that rich taste of Biryani. I have tried all brands of rice from normal daily use to super fine Basmati. For best results keep washing the rice till the water remains clear. For normal rice it require 5-6 washes, for really old Basmati at least 15 washes! I have also tried all sorts of curd, the best results are from home made one. Warm the milk to around 40 degrees centigrade (should feel warm on a finger, not hot). Put a tale spoon of curd (either home made or store bought) and let it set. In warm weather it takes a couple of hours in cold weather upto half a day. To prevent it cooling a lot in cold weather, use a couple of layers of towels to cover the vessel all round. Contrary to popular belief, curd from full fat milk adds to the taste. I tried chicken biriyani for the first time. It turned out great but little burnt. I will adjust the cooking time in my next try though. Thanks for a great recipe. This is awesome! gonna make it the “nth” time! thanks a million for such a wonderful recipe! Wow…nice recipe try it yesterday…turned out great…got a lot of compliments from my DH….Thx a ton…keep up the yum!!!! can we use the rice cooker to cook the rice ? I tried your dum biryani, it came out really good.Thanks for nice recipe. Hi thanks for sharing this receipe. This receipe is a super hit in my friends circle. I have made this nearly 20 times we just love it. We don’t miss restaurant biryani now as this receipe brings the restaurant food in the house. Really.. a super SBS guide on to prepare a better than restaurant Biriyani…. fantastic recipe… made it several times…. evrytime, it gets better ! thanks ! Hello.. Wonderful recipe…I want to ask…tht if we have to cook this biryani using the same raw meat version in “beef”…how long would we have to cook? Wht would be the cooking time on dum for beef in raw meat method? And, would we have to use a meat tenderizer also..like raw papaya paste? And how much of raw papaya paste should we use in 1/2 kg beef? Or u can also tell me the cooking time for mutton,using raw meat method?
. Marinate the goat meat in curd, salt, mint leaves and spices, overnight (preferably for two days) in the refrigerator.
. Half cook rice with spices – salt, mace, cloves, big cardamon etc. 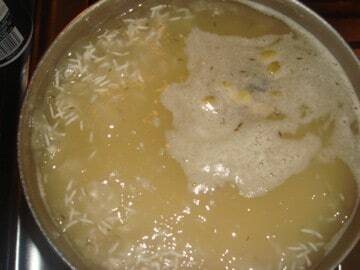 The rice should just about soften.
. Fry thinly sliced onions in just sufficient oil.
. Mix the marinated mutton with one third the onions and the oil and layer it in a thick pan. There should not be more than 1 1/2 layers so the pot keeps widening as the quantity increases.
. Layer rice and fried onions. I prefer three layers.
. Cover the pot and seal it with dough.
. Place the pot on high heat till you can hear the water boiling, then reduce to minimum heat. 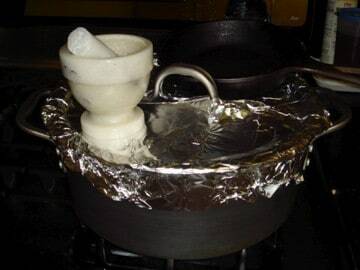 For mutton I use a “Tawa” on the gas and the pot on top of it.
. The biryani should be done in 2.5 to 3 hours – depends on the meat toughness.
. For lamb and chicken the time should be 1.5 hours.
. In spite of what is said, do not use raw papaya or other tenderizers, it reduces the meat to a mushy consistency. The above method ensures that the meat is fully cooked and soft. First, I never cooked beef so I do not know how long it takes to cook beef. You would need to use meat tenderizer or papaya paste if you are cooking raw meat method. I tried cooking raw meat method with baby goat and the result was not always consistent. Sometimes it would turn out good and sometimes the rice was overcooked or the meat wasn’t properly cooked. Red meat (goat) biryani I prefer pre-cooked method. I can guide for cooking raw meat method with beef/mutton but you will have to go by trial & error to find the right cooking time. If using papaya paste, you can add 1 tsp paste or about 1/2 tsp meat tenderizer for 1/2 kg beef. I would still cook it for 10-15 minutes on high and then cook for 20-25 minutes on low heat. Since you would be using meat tenderizer, meat should cook very fast. So I am assuming the cooking time I mentioned should work. Do let me know how it came out. Happy cooking! What is bay flower/ biryani flower?? I googled it but still couldnt find it. I usually bring it from India. Indian stores in the US do not carry it. You can omit it you can not find it. Thank u so much for the delicious recipe..we enjoyed every single bite..we had the biryani with raita which was also adapted from this blog..thank u again..will do it again..from Malaysia.. I am glad you liked the biryani and want to send to your family. As for the packing advise, all I can think of is hot thermal bags. You can put the food in plastic or may be even in steel boxes and put the boxes in thermal bag. Wrap the thermal bag in a plastic bag put it in the checked luggage. OR good old hot packs are a very good option but carrying it might be a problem. If keeping it warm is not a requirement and if your relatives can re-heat it, then you can get it packed in plastic bags. I do not know where you live. At least in Hyderabad there are a few places where they seal and pack the food for air travel. This is very useful specially for people going abroad. I always get my pickles packed from them there is no oil leakage at all from the packets. If there are any such packers in your area, you can get it packed from them and then put the packets in checked luggage. But the food has to be at room temperature as they use plastic covers to pack the food. Let me check with others and see if they can suggest any more ideas. Keeping it warm for four hours or more is not feasible as it is best eaten piping hot. Keeping it that hot will keep cooking it and you may end up with an over cooked and mushy rice. For transport by air it is best to cool the biryani, pack it in plastic bags and cool it in a refrigerator, or even freeze it. Then put it in another bag and seal it. For reheating, it is best to take the biryani out of the bags, put it in a casserole with dis. Add a dash of water and microwave it at half power for 5-10 minuets, depending on the quantity. When ever I cook Biryani, I freeze the excess (as I make two to three kilo meat at a time) and reheat and eat it over the next few days. If it is properly reheated, you will never figure out whether it is fresh or frozen. Ajoy, thanks a lot for the reply. I knew you would reply once you saw this comment. I really appreciate the way you always answer some of the questions readers ask here. Again, thanks a lot! Rama, I never kept the biryani hot for so long. Talking to some of my friends, from their experience, the briyani went stale after few hours of leaving it in a top place. Since warm temperature is a breeding ground for bacteria, they have advised against keeping biryani hot for so long. Also, as Ajoy mentioned, biryani will continue to cook if it is kept hot for too long. Superb, Excellent, Awesum….chanced upon your recipe today and tried it todayself it. Turned out marvelous. I also added fried dry fruits and used ghee instead of oil. Its easy and tasty. hi, I am a malayali, i loved Hyderabad’s paradise briyani. Thanks for your recipe, it came out so great, right texture, good taste.After lot of trials from various blogs this one really got it right. But we love to have a bit more gravy with chicken in the briyani how to get it what ingredients need to be added, our chicken were short of masala with it, a bit dry. Please suggest. Thanks once again for this wonderful recipe. You can add more yogurt. That would give more gravy or rather it won’t be very dry. Do not change the cooking time though. Thank you so much for this recipe. My husband and family were all praises and some aunties actually even asked for the recipe…It turned out really well and perfect. I jus took extra care with the cooking…kept on high flame for not more than 5 min and slow cooked it for 30 mins…. Will definitely try this again with a Turkey…any tips on that?? I guess cooking time should be more. Or should I pre-cook the turkey? Sorry Bincy, for the late reply. I somehow missed this comment. Good to know your family liked this recipe. As for cooking with turkey, don’t cook turkey except for ground turkey once in a while. We are not big fans of turkey. I checked some of the turkey curry recipes online and looks like the cooking time for turkey is same as the cooking time for chicken. I think you can follow the same cooking time. One thing to keep in mind is though, is the size of the the turkey pieces. If the pieces are big, you may have to cook it a little longer. Hope this helps and sorry again for the late reply. In between layers add ghee instead of oil for enhanced taste. Yes, adding ghee does enhance the taste. But I do that only when I make it for parties. When I cook it just for us, I avoid ghee. Thanks for the tip though. Rose, yes double the quantities for 9 people and you might have some leftovers. It depends on how you serve it. If this is the only food you are serving, double the quantity should suffice. Cook for 10 – 12 minutes or couple of minutes longer until steam escapes and then cook for 20 minutes on medium low. Let me know how it turns out. Thank you! Instead of 2″ chicken pieces, I want to cook leg pieces. Does it have any impact on the cooking time? Please respond. Rose, no it should not matter as long as the leg pieces are not very big. Spread the leg pieces evenly on the bottom of the pot so that all the pieces cook evenly. Sometimes I cook chicken drumsticks without cutting into smaller pieces and it comes out fine. When you cook on high for 10 minutes make sure steam escapes from the foil. If not cook for another minute or two on high, before reducing the flame. Happy cooking!! 1. Letting the steam escape tells you when it has reached the cooking temperature. 2. Slow the flame/heat at that point so that the steam stops coming out, and then seal the lid fully. The Biryani will now have just enough heat to cook, but not enough for the steam to escape and dry it. 3. Larger meat pieces may take more time to cook, but the chicken; especially the factory reared broilers; will cook in half an hour. 4. I normally cook at a lower heat for about 75 minutes. That cooks all the pieces perfectly and infuses the rice with the spices used in the marinade. 5. For perfect cooking, the layer of meat should be one piece thick, tightly packed. No overlaping of pieces as far as possible. You never mentioned what to do with the chicken marinade or onions after frying. Do I leave the onions and add the chicken or take the onions out and add the chicken to the left over oil? As mentioned in step 8, you would need a heavy bottom saucepan or a dutch oven to cook biryani. For this recipe you would need at least a 5 quart / liter container. I used a frying pan to fry the onions. After frying, you can remove the onions from oil or leave it in the pan. I used a separate pan for cooking the biryani as mentioned above. You can use the same oil in which onions were fried when arranging and layering chicken and rice (step 8, 9 & 10). If you wish to use only one pot for frying the onions and cooking the biryani, first fry the onions, remove from oil and keep aside. Also remove some of the oil in which onions were fried. In the remaining oil, add the chicken as in step 8. You can use the oil that was kept as side to pour on the rice when layering. I hope I am clear. If you need further clarification, please do not hesitate to ask. I am always confused with half cooked kind, if u soak rice in water for 30 minutes how many cups of water we need to take while boiling? And after half boiling the rice how many cups do we need to add while doing the dum? If we soaked the rice for 30 mins agian boil it again steaming it wont he rice become like a paste? Shree Vatsasa, You soak the rice for 30 minutes and when cooking the rice, take 1:4 rice to water ratio. I usually do not measure the water that I take for cooking the rice. For this recipe I take about 3/4 – 5/8 of water in a 4 quart/liter pot; it would be appox. 16 cups of water for 4 cups rice. When the water is boiling add rice and cook for just 2 – 3 minutes, until water begins to re-boil after adding rice..
You do not need to add any water when doing the dum. Chicken will release lot of juices and the rice will be cooked in that. I hope this helps. This is a little tricky and you just need to figure out the cooking time by trial and error. The time I mentioned in the recipe work on my gas cooking range. I have three questions about this recipe which sounds amazing. Do you get a flavor difference if you seal the pan with dough instead of foil? Does the chicken burn on the bottom or can you put a tawa under the biryani pan? I used oil but you can use ghee instead of oil. Ghee adds more flavor to biryani. I cook biryani very often, 3-4 times a month and switched to oil. There might be slight flavor difference if you seal with dough. Though I use foil to seal, steam still does escape. Sealing with dough traps most of the steam inside and does enhance the flavor. My chicken does not burn at the bottom. It depends on the thickness of the pot/vessel you are using and also the heat. If your pot is not heavy bottomed, you may want to use place the pot on a tawa. Hope this clarifies your doubts. Happy cooking ! Just a quick query. Should the rice be soaked for atleast 30 mins? Will it impact the long grain of basmati if the rice is not soaked? The longer you soak the rice, the less cooking time required. Also as the soaked rice has absorbed water, you need less water. The reason I asked if rice needs soaking is when I cook I’ve noticed that the rice grain is puffier;its is not sticky and takes 5-6 min extra before I can add it to biryani. But I needed to know if rice grain is puffier if the rice is not soaked or is because of the kind of basmati that we are using at the moment. The oil I use is minimalistic, will that be a reason to puffy rice rather than soaking? Rice absorbs water while cooking. The longer you cook the more it absorbs. Different varieties and different aging result in different water absorption (both rate and absolute). In your case it is difficult to diagnose why the rice is puffier, most probably it is different batch to what you have used in past (variety or age). The only thing I can suggest is that you cook the rice; once without soaking and once with soaking; for the same time and with same amount of water and then compare the results.